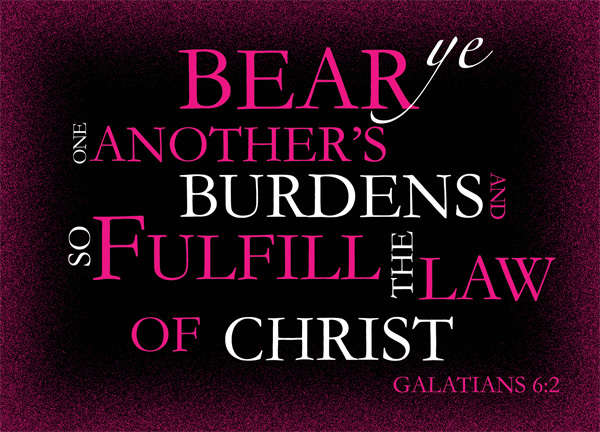 Let me first get this out of the way – bear ye one another’s burdens, says Paul in verse 2 of Galatians 6. A few verses down, in verse 5, he says, every man shall carry his own burden. Is there a contradiction? Every man is responsible for his own load. Each one of us are responsible for our actions and accountable to God for what we do [Rom 14:12]. Yet, if anything, this verse is perhaps more on love – the love for your brothers (and sisters) in Christ. The love that compels you into sharing the burdens of one another – even though each man should bear his own burden. If you bear a burden yourself, it is heavy. If you share your load with someone else, and help carry his load as well – it’s the same weight, probably, mathematically, technically, but it will feel lighter. That’s love. In this study we will look at what some of these burdens could be, and meditate upon them. Bear ye one another’s burdens – What burdens? What is Paul referring to when he says ‘burdens’. I can think of three possibilities that fit the frame of the context – firstly the burdens of our sins. We are not able to remove the sins of one another – certainly not. Only Christ has the ability to cleanse us of our sins, and while he has technically done so by dying for us for our sins, it doesn’t mean that we do not sin; it doesn’t mean that we aren’t troubled by our inability to stop sinning; it doesn’t mean that we aren’t weighed down by the impact of our past sins; it doesn’t mean that we won’t be tempted to sin. Bear the sins of our brothers and sisters in Christ – we can’t claim the sins of others as our own; like bearing the crime of others as a scapegoat – its simply not possible because the judge of our sins is God – and you simply cannot fool God. Before God there cannot be any scapegoats for a sin; no wrongly accused, and no guilty man walking off scotfree. Before God you can not make another person responsible for your sins; and you cannot take the punishment for another person’s sake. But what we can do, is to be a source of comfort when they are fighting and struggling against sin; to stand beside them as they step out of the weight of their past sins; to pray for God’s strength and mercy upon them. We all have our own faults, we all have our weaknesses, we all have that one or two walls we cannot seem to get pass. If we can’t remove them, our peers certainly won’t be able to remove them for us – but yet as it weighs down on us, our peers can help us overcome our weaknesses, can help us avoid the walls that we have for ourselves. They can help us accomodate ourselves, if they know about our weaknesses, if they know about our faults. If you know that one of your mates struggle with the virtue of patience, well, if he’s in-charge of a project, make sure you’ve got a calmer person working with him. If you know a friend is addicted to games, then don’t invite him to a session of LAN with the youths. We cannot save one another from anything much, technically speaking, but we can share the weight of their burdens if we are aware of what their burdens are, especially if we are older, or more matured, or simply spiritually stronger – We who are strong ought to bear with the failings of the weak and not to please ourselves [Rom 15:1]. It’s not like you should absolve them of their failings, but you can be patient, you can be tolerant, you can give them a chance and let them learn. I think this could be more common – or at least more noticeable, perhaps. Not that we aren’t often burdened by sins or our lackings, but many times, our sins and weaknesses often lead to further afflictions as well, no? Sometimes afflictions are self-inflicted; but yet often they aren’t – at times sufferings seem to happen unfairly to us, and it is hard to bear. It is hard to face. I am reminded of Job’s three friends, who travelled a great distance, and tore their clothes from afar when they understood the magnitude of Job’s suffering. Sure, Job was rather upset with them for the majority of the book of Job, but I would like to think that in retrospect, when Job looks back at his time of suffering, he would be glad and thankful for his three friends who accompanied him during his plight, his three friends whom, in their own ways tried to bear the weight of his burdens. I often consider what I can do for a person in affliction and I can scarcely come up with an answer. Words of encouragement are often heard too many times to carry any meaning anymore for a person in long suffering. Hope for deliverance and hope for recovery may often be misleading, too. Often as a Christian I find myself only able to offer an encouraging smile and say, I’ll pray for you – but even that sounds so empty at times. Bearing the weight of one another requires sacrifices. A sacrifice of money, a sacrifice of time, a sacrifice of pride, a sacrifice of leisure. Bearing the weight of one another often requires us to learn how to, first, humble ourselves down. Humble ourselves to not judge the other. Humble ourselves so that we can deal with the emotions of somebody pushed to a corner, agitated, desperate or sensitive. Humble ourselves that we may understand that we have no strength to do anything for the other person, but it is God, who through us or not, who truly is able to change things. Bearing the weight of another requires, most importantly, the love for the other. If you do not love one another, you wouldn’t care to make sacrifices. You wouldn’t care to help. You wouldn’t care to pray. And that is the law of Christ that will be fulfilled when we learn to bear the burdens of one another. That is, the law issued by Christ himself, the law to love one another – A new command I give you: Love one another. As I have loved you, so you must love one another [John 13:34].